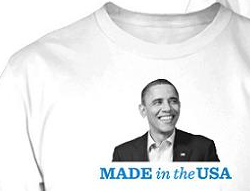 I don't think Barack Obama's re-election campaign is the absolute best place to make large contributions, but I liked this t-shirt, and you can get it for a donation of $25, so I sent them some money. One reason I want to wear it is that there could be confusion about whether I'm made in the USA too, and the shirt correctly describes my location of manufacture. It appears that Obama really did convince some previously unconvinced people that he was born in the USA with the release of his birth certificate. Polls show the percentage of birthers falling from 20% to 10%. I didn't expect that, because I had thought they were too far gone to be swayed by rational evidence. My guess about what happened is that it gave non-birther elites in the GOP an opportunity to tell followers that this really wasn't the anti-Obama argument to make. I don't think any substantial fraction of the former birthers will actually vote for Obama, because they probably don't like Obama for other reasons as well, but it's nice to at least convince confused people of one true thing.